Home is what inspires us. John's Waterproofing is a valuable part of a home-health team. Florally-inspired picks plucked from our favorite creative market. Portland artist Lisa Congdon shares tips to make the most of the space you create in. Oregon Home publisher Courtney Kutzman and her family spent a perfectly sunny early spring weekend in Bella Beach. The picturesque Oregon Coast neighborhood near Depoe Bay was the location for the latest edition of our Home Away From Home series with Meredith Lodging. A writer remakes a home and a life in the woods. 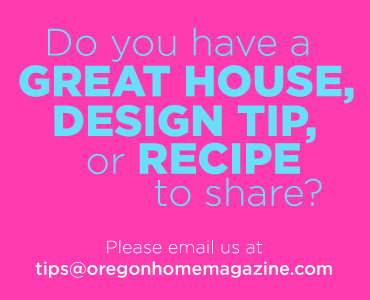 Submissions are open for the Oregon Home Magazine Structure + Style awards. Meet the women who are making high art (and great business) out of traditional domestic craft. A Street of Dreams builder shares some new additions at the Kenton Women's Village. The season’s new growth signals a new year of possibilities, and no one embraces this sun-shiny optimism more than Gregory Gourdet, James Beard-nominated executive chef of Departure restaurants. Modern quilting creates fresh looks with fabric.